Sit back and relax as you sail along the picturesque Santa Cruz coastline for sunset! 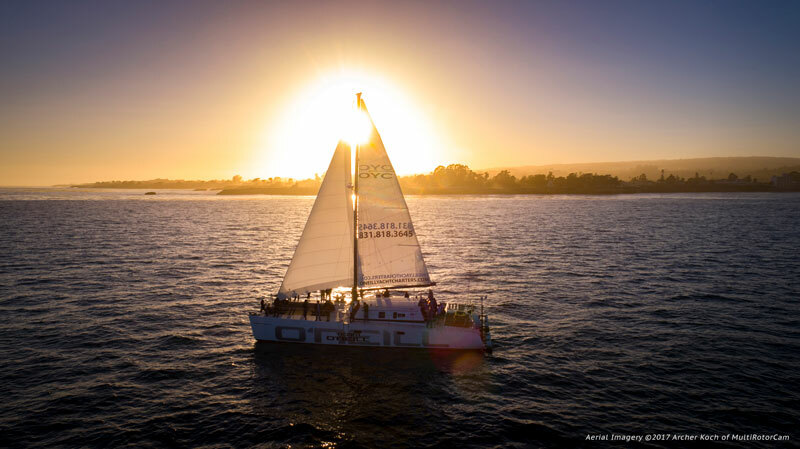 Once aboard, you can enjoy the sights of the Monterey Bay wildlife and Santa Cruz’s must-see landmarks from the best view in town, all while experiencing the fun of sailing on a smooth, stable catamaran. Keep your eyes open for sea lions hanging on the pillars of the Santa Cruz Wharf or off the Mile Bouy, otters relaxing in the kelp forests, and dolphins or whale tails that just may spring up out of the water at any point during your sail. Bring your camera to capture the beautiful California sunset, as we see the sun dip below the horizon. Often times, we may pair this type of sail with our Local Wine Tasting Sails or Local Beer Tasting Sails that are sometimes also scheduled around sunset.